(CNN) -- President-elect Barack Obama announced Thursday that he has chosen former Sen. Tom Daschle to lead the Department of Health and Human Services. President-elect Barack Obama says health care must be addressed in order to fix the economy. 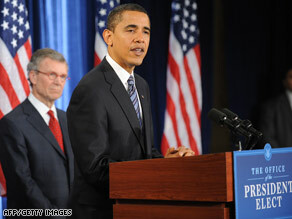 Obama said Daschle would also serve as the director of the White House office of health reform. The president-elect said he has selected Jeanne Lambrew to be the deputy director of that office. "[Daschle] will be responsible not just for implementing our health care plan. He will also be the lead architect of that plan," Obama said, calling Daschle "one of America's foremost health care experts." "If we want to overcome our economic challenges, we must also finally address our health care challenge," Obama said. Daschle said he looked forward to that dual role of both generating and implementing reform. "At a time that there is so much at stake, there is no question that fixing health care is and has been for many years our largest domestic policy challenge," Daschle said. "Addressing our health care challenges will not only mean healthier and longer lives for millions -- it will also make American companies more competitive, address the cause of half of all of our personal bankruptcies and foreclosures, and help pull our economy out of its current tailspin." In November, Daschle said he was excited about the possibility of serving as point person in Obama's effort to change the nation's health care system. Daschle is on the health care advisory group of Obama's transition team and said he plans to write the health care plan that Obama will submit to Congress next year. "I hope to have the plan enacted by next year, and then it will take several years to implement," Daschle said last month. Daschle said reforming health care in the United States must be a priority in the current economic climate. "We can't afford not to do it," he said. "If we do nothing, we'll be paying twice as much on health care in 10 years as we do today." Daschle served as Democratic leader in the Senate from 1995 until he lost a re-election bid in 2004. Representing South Dakota, he was first elected as a congressman in 1978 and served in the House until he was elected to the Senate in 1986. He recently wrote a book on health care titled "Critical: What We Can Do About the Health Care Crisis." In the book, he pushed for universal health care coverage to reach 46 million uninsured Americans by expanding the federal employee health benefits program to include private employer plans together with Medicaid and Medicare. Most Republicans oppose any such plan, saying it would give too much power to the government. They've also questioned Daschle's recent work for a Washington lobbying firm. iReport.com: What do you think of Obama's cabinet picks? His wife, Linda Daschle, is a registered lobbyist for a firm that includes health care clients. But a source close to Daschle told CNN that Linda Daschle would be leaving the firm at the end of the year to set up her own company focusing on transportation lobbying in order to clear any potential conflicts of interest. As Obama continues to fill out his Cabinet, three Democratic sources say the president-elect is likely to name Steven Chu, a physicist who runs the Lawrence Berkeley National Laboratory, as his energy secretary. The three officials said the announcement is expected next week in Chicago, Illinois, and that Obama will also name Carol Browner, administrator of the Environmental Protection Agency in the Clinton administration, as the newly created "climate czar" inside the White House. CNN's Candy Crowley and Ed Henry contributed to this report.